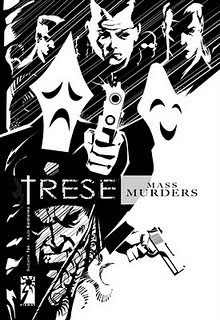 Reading the first copy of Trese was hard to ignore The Kambal aside from agent Alexandra Trese, ofcourse. I mean these two shared most of the funny moments in Trese's breath-taking escapades with the underworld and my ever favorite line goes like this,"Gago, a Higante can't fit in the banyo" (while investigating the death of some of the members of the Black Knight, re: Trese, Murder on Balete Drive ). And with the third book, I have found out how this bunch became part of the picture – cool if you ask me. Budjette Tan has his own way to surprise his readers. And my best bet is that Basilio is the one wearing the smiling mask, the frowning one could be Crispin(?) uh oh, the book obviously wants another surprises that the other Kambal wasn't named. And it couldn't be Sisa, for sure lol. The last five chapters that starts from chapter nine down to the chapter thirteen (Trese) is not typical the other two books were presented on which each chapter has a new story/plot. Here in the last installment, every chapter is a continuation of the previous. The story showing Alex in her early days and how she would be destined; like how her birth was prophesied as the one to fulfill a great undertakings to be the chosen one (Harry Potter?) as the ultimate force to the Underworld being the sixth offspring (sounds like horcruxes, eh) to the famous Trese clan. On her 18th birthday, she was summoned by her Lolo (Grandfather) for a test to determine her capabilities if she's worthy of the title as being the chosen one (ang takda, Lia?). She was presented with gifts, Cloak of Takipsilim (twilight) - cloak of invisibility ba ito lol. The Sinag (ray of light or simply the light) – wow, deluminator ni Ron? It's actually a silver knife. And the third gift is a pouch (beadle bag ni Hermione naman, eto haha – laugh trip) containing all her gifts that composed mainly of agimats (magic charms) to be used in her journey as she takes a simulation exam on Teach Yourself to become the Ultimate god of the Underworld in 24 Hours by Sams, with CD inside, lol. Now, I don't want to go spoiling you just in case you might want to purchase the book yourself. All, I can really say, is wicked believe me.